I like the guessing game. So I'd say keep sharing. Stefon Diggs was talking about wearing all-purple again this year (yuck) on twitter earlier this summer. So I'd expect them to do it at least once this year, IDK about Week 1 though. Hopefully they go all white at least once too. One guess is the Giants. The other is the Saints. on TV it didn't stand out as a great combination, but fun for preseason. glad to see the P4 @ Pit game returns to the all whites w Steelers in black and gold (call me a traditionalist). The only way that happens is if Arizona decides to wear white, something they haven't done at #TheBigToaster since 2009. I'm really hoping this white over navy look is just a preseason thing and doesn't become their standard road look. This team looks too much like the Seahawks from the broadcast view with this navy-heavy, futuristic look that clearly needs more of the light Titan blue overall. After all, the Titans are known for their "two-toned blue," yet the only notable light blue we really see is under the shoulders, which is blocked by the players arms most of the time anyway. And the two shades of gray/silver on the pants are pretty pointless and could easily be silver and light blue instead. 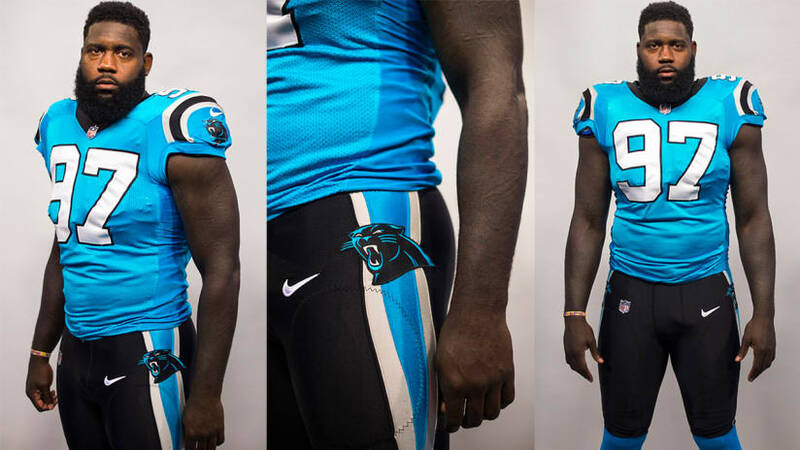 Light blue socks would also look a lot better. There's so much potential with this new set but I feel that it's wasted with combos like this. I can't even say that there's potential there because I don't think that there's a single element that couldn't be improved by reverting it to what they had last. I've got nothing nice to say about the TennesSeattle TightHawks. Btw, anyone who can look at this photo and still wants to say that a number outline "adds needed color" can bite me. In week 1, one team is busting out color rush right away. It's probably the Lions or Broncos. After all, the Titans are known for their "two-toned blue," yet the only notable light blue we really see is under the shoulders, which is blocked by the players arms most of the time anyway. Correct me if I'm wrong, but didn't the Titans owner iterate that they'd be going the navy route with Columbia as more an accent? If that's true then the uniforms they're wearing make sense. Looking at the uniform in that photo and live gameplay though, they clearly made a mistake with these (I mean, it was evident from day one, but it's just exacerbated here). The Broncos are wearing their color rush against the Steelers, the navy blue against the Chiefs and Browns. The Lions wear throwbacks for Thanksgiving and will wear their color rush against the Panthers. I don't know if Detroit will use their third allotment. I'm thinking the Giants will wear their color rush because it's going to be warm at Metlife, and the Jaguars could wear their teal to combat the heat/sun. The Bengals are wearing Color Rush Week 1 at Indy. They just announced their uniform schedule on the official Bengals Twitter. Orange versus Dolphins Week 5 and Saints Week 10. Huh, why? You only see teams use alts on the road to beat the heat against WAH (Titans, Panthers come to mind), but the Bengals are simply trading white-on-white for white-on-white. It’s not like Lucas Oil is notorious for heat, either, regardless of if the roof is open or not. Why not save them for the home crowd, who Im sure they’re popular with? I think it's gotta be Atlanta. One out of conference team in the middle of the season between those to games. I'm hoping maybe the Browns secretly got approved to do what the Rams are doing and wear their Color Rush as many times as they want. The fact that the team said "more than once" seems to hint at something more open-ended than just twice. And I doubt they'd wait til Week 16 if it wasn't gonna be something relatively frequent.